New edition includes corrections to the content ( lemmas , words of text , context , Cochrane numbers ) since the publication of the second edition in 1998. A header alphabetical location on each page. Includes a DVD video presentation on how to use our similarities and our dictionaries . To send this page to friends . Video presentation on the use of our survey instruments . A concordance enables you to locate a biblical passage which we know the reference but we remember at least one significant word . Unlike a simple index , the correlation gives some of the background accompanying the word to clarify the meaning . 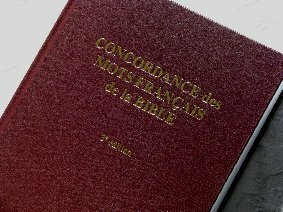 For more information see pages Presentation of Concordance ( PDF file). This agreement , containing all the words of the Bible, except accessory words ( . Articles, prepositions, etc. ) is based on the text of Louis Segond revised in 1979 , called " New International Version " and is valid 100% with the 1910 text and the textual variants from 1975 to 1978. Cochrane number that refers to the Hebrew word (AT) and Greek (NT) where the original French word . Cochrane numbers are version 2 revised, corrected and enlarged in the 20th century Strong Numbers published for the first time in the 17th century .